Assoc Prof Rokiah Don, Nutritionist, Council Member of Nutrition Society of Malaysia and Former Director of Nutrition Division, Ministry of Health Malaysia. Complementary feeding is defined as“the process starting when breast milk alone is no longer sufficient to meet the nutritional requirements of infants, and therefore other foods and liquids are needed, along with breast milk.” Any non-breast milk foods or nutritive liquids that are given to young children during this period are defined as complementary foods. The National Breastfeeding Policy for Malaysia was formulated in 1993 and revised in 2005, whereby exclusive breastfeeding is recommended for the first 6 months of life and continued breastfeeding is recommended up to 2 years. Complementary foods should be introduced at the age of 6 months. The timely introduction of complementary foods that are adequate in terms of quality and quantity, as well as appropriate for age is essential for optimal child growth and development during the “critical window” period particularly from birth to two years of age. Why start at 6 months? By the age of 6 months, infants are growing physically and becoming more active, and their bodies need more energy and nutrients than what milk alone can provide, particularly protein, iron, zinc, and fat-soluble vitamins (A and D). Thus, complementary foods, in addition to breast milk, are necessary to make up for the babies’ additional nutritional needs. Furthermore, most infants are developmentally ready for other foods by this age. However, if complementary food is introduced too early, infant’s digestive system may not be mature enough to digest solids, and this can lead to digestive problems and a higher risk of developing food allergies. It can also result in a shorter duration of breastfeeding and a higher risk of obesity in future due to overfeeding. 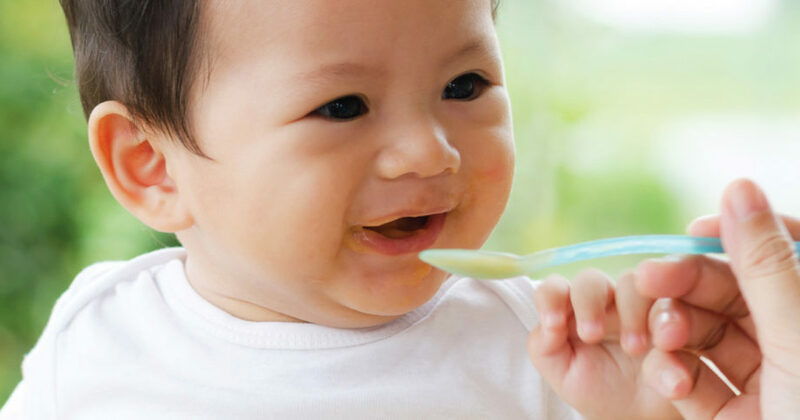 In contrast, late introduction of solids can affect the oral-motor development in infants, causing feeding difficulties later. Furthermore, it also increases malnutrition risks, including stunting. 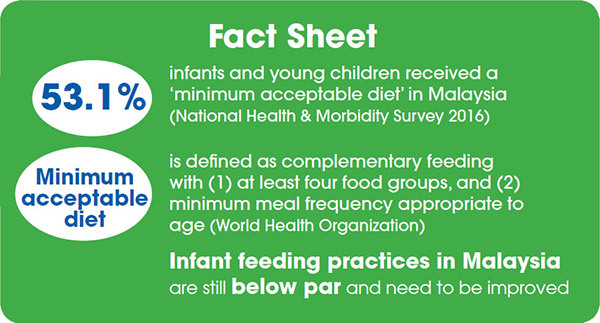 Feeding of all infants and young children should be timely, adequate, safe, appropriate and proper. 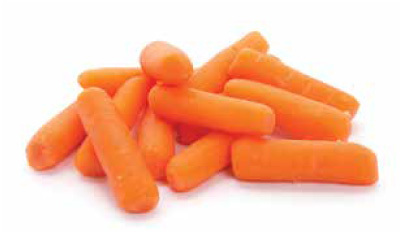 6-8 months: Pureed, mashed and semi-solid foods. 9-11 months: Chopped soft food, as chewing skills are developed; finger foods such as soft biscuits and fruits can also be given. 12 months onwards: Family food, as biting skills are developed. Apart from the nutritional guide, complementary feeding has to be applied together with safe and hygienic food preparation. Also, apply responsive feeding by responding promptly and on demand to your baby’s signs of hunger or fullness, and by being warm and nurturing while feeding him. By implementing good complementary feeding practices with your baby, you will be able to ensure his optimal growth and development, and secure a good start to his future. 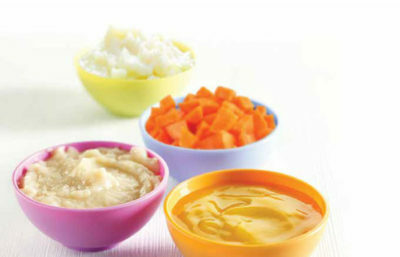 You can find more tips for preparing and feeding complementary food to your baby on our website: mypositiveparenting.org.